Mod skin DotA software enables users to use paid sets or cosmetics for their favorite hero in DotA 2 for free. DotA players can now enjoy premium sets without annoying anyone in their game. I bet you’re tired of paying real money to Valve just for those shiny cosmetics. Don’t worry, mod skin DotA is here and ready to give you free access to almost every sets in DotA 2. By the way, if you’re tired and doesn’t feel like reading this long-a** article, you can go ahead to the download page. DotA has a long history and it’s been around for more than a decade. According to Wikipedia, it began in 2003 when IceFrog, the DotA God himself started to mess around with Warcraft’s custom maps. It got so popular until Valve’s owner Gabe Newell decided to bring DotA into Steam and renamed it as DotA 2. Fast forward today, DotA 2 is still relevant and very popular that once held the highest esportÂ prize pool of all time until Fortnite tops them. Before you jump over and download the mod, I suggest readingÂ the instruction on how to download dota 2 mods. And make no mistake, this mod is only visible to you (the user) so your teammates and opponent wonâ€™t see the mod. Disclaimer: I do not own this mod skin, if you have any question, you can go theÂ official siteÂ of this mod. To play DOTA 2 with a mod skin, you need to use a software calledÂ Mod Skin DOTA V6.1, it is developed by a DOTA 2 player to help the DOTA community play with their own customized hero. Step 1:Â Download the file. Step 3: Before you extract the files, don’t forget to create a new folder to avoid lost files. 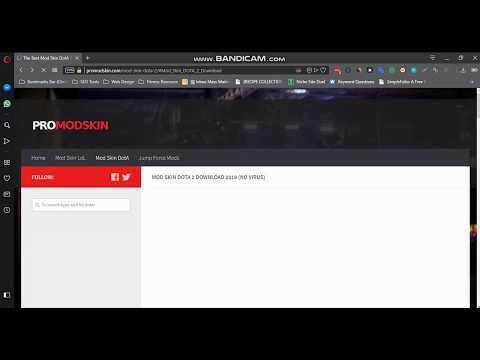 Step 4:Â Run “ModSkinDota” as administrator. Choose the path on where your DotA is installed. Step 5: Select the hero you want to use a mod. Step 6: Click save and mod. Yes! This software is very safe. Just run your antivirus if you’re still in doubt. Are you going to get banned using mod in dota? This JoinDota thread explains it. Although keep in mind that there’s still a chance that you will get banned because you’re still using third-party software. As long as you’re not modding the actual gameplay or using custom scripts, you’ll be fine. Don’t be like those guys who use auto-script or map hack.